​Since the Broughton family had a pre-Reformation chapel on the site, it is clear that burials would have taken place in the circular cemetery area. No very early grave markers have been found but is is clear that those living in the area, who were allowed to worship in the chapel, were also allowed to be buried in the churchyard. The original churchyard clearly belonged to an earlier building on the site and was circular, a common feature of medieval churchyards or cemeteries. This ancient burial ground was consecrated on 30th January 1634. In 1907 Sir Delves Broughton transferred the church and a portion of the churchyard to the Ecclesiastical Commissioners while reserving all rights to the other portion on the roadside, and these rights passed to Mr John Hall when he purchased the estate. The first extension to the churchyard was consecrated in 1907 and the second extension in 1933, thus creating the grounds that we have today. There are many interesting stones with quaint inscriptions in the churchyard, while many others lie hidden beneath a covering of grass. Most of these stones lie between the east end and the car park. Henry Bennett, a benefactor who left £800 to the village, lies in a privileged position by the priest's door. This position was usually reserved for priests. In 1837 Thomas Davenhill of Wetwood, whose name and the date appear on the top bar of the wicket gate, made the iron railings. The Broughtons lie in a vault under the sanctuary. 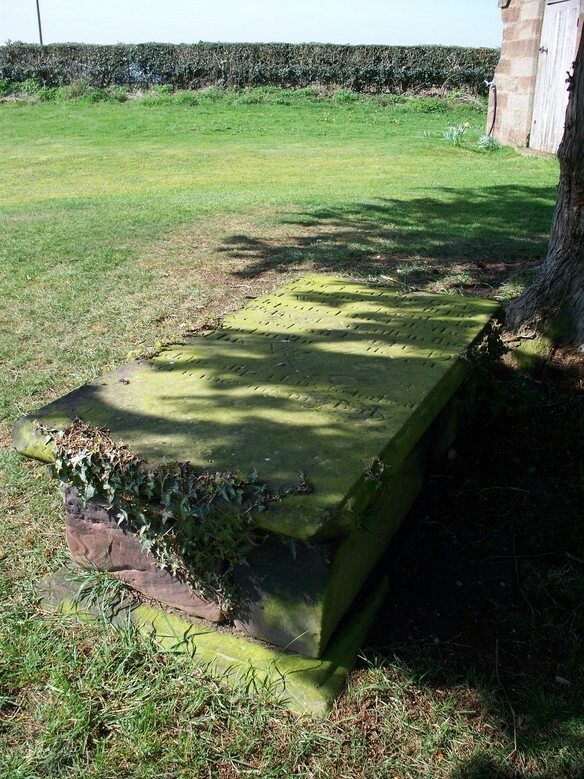 An extension to it has been made in the churchyard just under the north sanctuary window and it was opened for the burial of the twelfth baronet in 1933. The Hall vault is behind the tower.